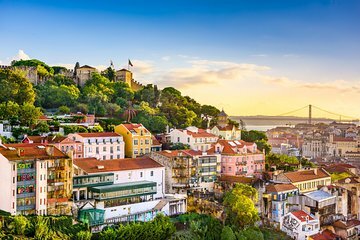 Discover grandiose landmarks and romantic promenades during this 4-hour private guided shore excursion and city tour in Lisbon. Explore the hilly capital’s abundance of historic Baroque churches, famous squares and its pristine seaside by minivan. Learn the history behind the lively atmospheres of the Chiado, Baixa and Belém districts from your guide. Finish your day sampling traditional Portuguese cuisine, including a sweet pastry, cod cake and Port (fortified wine). This worry-free Ports of Call tour is perfect for seeing the city's best sights before returning to your cruise. Meet your guide at the Lisbon port and hop into an air-conditioned minivan for your 4-hour private guided shore excursion. Begin your adventure by experiencing the intriguing history of Lisbon. Visit Lisbon Cathedral (Sé de Lisboa), the oldest church in the city. Hear how the cathedral survived devastating earthquakes, including the Great Lisbon Earthquake in 1755, and observe its architectural renovations in both Romanesque and Baroque styles. Next, drive up to the hilltop neighborhood of Graça and admire panoramic views of Lisbon. Continue to the old quarter of Alfama, known for its Moorish heritage and the establishment of fado music. Then, head down to the Belém district and enjoy the serene coast of the Tagus River. Visit the Monument to the Discoveries and learn about the famous navigators like Vasco da Gama, the explorer first to reach India by sea. After stopping at the UNESCO World Heritage Sites of Belém Tower and the Jerónimos Monastery, taste a delicious pastel de Belem (pastel de nata). Learn how this egg tart pastry was created before the 18th century by catholic monks at the Jeronimos Monastery. Drive onward to the Chiado district passing the Basilica of Estrela. Then, walk through the lively Baixa district and see its elegant squares including Restauradores, Rossio, and Figueira. After a stroll, perk up your taste buds with a fresh glass of vinho verde or “green wine.” Savor this young wine with traditional flavors of cod cake. Then, try a pour of Port paired with local cheese. After a fun four hours head back to the port where your tour ends. Please note: Your cruise must dock in port in good time for this excursion. Click on 'Important Info' and check the Departure Time details before you book. Don’t fret, this tour ensures you will get on your ship! In the unlikely event that your ship has departed, we will prepare transportation to the next port-of call. Plus, you can book worry free. If by chance your ship is delayed to arrive and you cannot attend the tour, we will refund your money. See our terms and conditions for full details. If you have children under 12 years old, please advise their age. Infant and child seats are available on request if advised at time of booking. Fantastic tour, our guide John was very knowledgeable about his city and provided great assistance, very helpful as I am a disabled traveller. Vlad was great. He has a great knowledge of Portugal and is a lot of fun to be with. We enjoyed our time with him and wish we could have spent a full day instead of only 5 hours. It was like spending the day with an old friend. We would love to go back and join him again. We highly recommend Vlad and his tour. Private tour was great. Great tour guide John, very knowledgeable, showed us all of the highlights if Lisbon. Opted out of the wine tasting, so John dropped us off in town for some shopping. This private tour was very interesting and our tour guide, Vlad was excellent. Our tour guide was very knowledgeable, professional, courteous and honest. Excellent way to see Lisbon on a private shore excursion. Money well spent. The four of us had a wonderful half day tour of Lisbon with our local guide, Harald. He knows the city inside out and gave us a nice balance of history with the local vibe of the city. The food and wine tastings were a worthwhile addition. I asked that he show us a nice place for lunch to end the tour and he did not disappoint, even getting us past the lineup due tot his friendship with the owner. Bloked with locals and a wonderful meal. Great tour! Excellent tour and well worth paying that bit extra for a private tour. This tour was one of the best we have taken on this cruise. Our tour guide was wonderful and explained everything....The stops that we made were very nice. I would recommend this to anyone. The Lisbon tour was very good. Excellent guide.